An excellent guide. Enjoyed the drive with David. He knows the region and cultures well. David is the perfect guide! 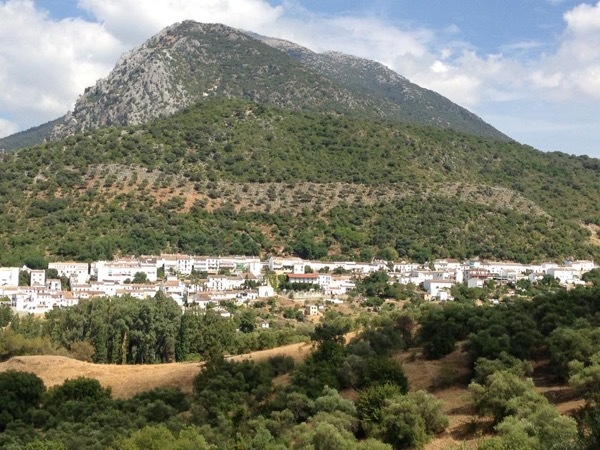 He tailored a trip to meet our desire for White Towns, Cadiz and olive oil! David is easy going and friendly. He allowed the tour to proceed at our pace. David took us to authentic local restaurants for superior meals, which we still savor! David also easily accommodated a last minute schedule change and drove safely in comfort. He made the tour relaxed and educational, while achieving our every goal, visiting beautiful towns we would have missed but for David! Select him! TOUR GUIDE RESPONSE: Dear Douglas, thanks so much for your feedback. I really enjoyed the day trip with you and your nice family so it was a real pleasure for me show you a bit of my region. Please let me know if you are back to Spain where you still have many places to discover. All the best. David. David's day tour of the White Villages was exceptional. He had great knowledge of the history and culture of the region. His driving along the scenic winding roads and parking in tight places was excellent. His day plan was interesting and involved good food, interesting artisan shops, awesome scenery and Spanish lessons. My brother and wife and I give David a high rating for his enjoyable company, interesting information and local knowledge, and great suggestions for other activities in Sevilla. Gracias! TOUR GUIDE RESPONSE: Great Kerry!! I am so happy you have enjoyed so much of the rest of your trip around Spain. It was a real pleasure to show you a bit of my beautiful region so hope to see you back here to continue with our Spanish/English leassons. All the best for Donna and Brian and for sure for you...I will be ready for more questions next time.. Very friendly guide who was very knowledgeable about the places we visited, taking us to the places we wanted to go and didn't try and takie us to places where there were salesmen on commission. David was a very good driver and informative in the characterization he supplied regarding the places visited. He was also supportive in guiding us to experience Cuevas de la Pieta, which we very much appreciated, outside of Ronda. David is knowledgeable and a pure pleasure to spend a day traveling to Rhoda with. We were a group of eight friends and asked David everything and he was able to discuss a wide range of topics. He is an absolute professional. David gave us a fabulous tour of Sevilla! He made sure we had plenty of time to visit the Royal Palace and the Cathedral. We also had a very interesting walking tour of the old city with a wonderful tapas tasting! I would highly recommend David! Exactly what we were hoping for in an individualized tour. We were looking to get beyond the attractions you could find yourself. The "tour" opened up other areas of the city to us and took us beyond the typical tourist sights. David was engaging , the type of person you felt like spending an evening with over drinks and conversation. A real human experience, not simply following a colored umbrella. We only wish we had booked him earlier in our stay. We were very lucky to have selected David. David was totally engaging, knowledgeable, and passionate about his city. He listened to our interests and was flexible with the itinerary. Jorge, our castle and cathedral guide wonderful - witty as well as thorough. If we could, we'd give them both a 10! We were a group of ten, and every one of us thoroughly enjoyed this tour. David was an energetic, charming, knowledgeable, and enthusiastic guide. He was able to answer questions about many different topics. The few places we stopped were great, and the food and drinks were excellent. This was a great way to see a beautiful and interesting part of Seville. I recommend this tour without any hesitation. We had David pick us up in Seville to take us to Granada. We made a couple stops along the way. David was incredibly easy to be with all day. (9 hrs.) He had so much knowledge to share but didn't overwhelm us. Our bus was comfortable with 8 people. I HIGHLY recommend him! David was an excellent driver and guide. We had a very informative visit to Sevilla and a fabulous lunch. We would highly recommend David to anyone wishing to visit Sevilla. David is a great guide who created a wonderful experience for us in Donana. He was very clear in presenting various options, both before and during the tour, to customize it to meet our interests and needs. He has extensive knowledge of the birds, animals, plant-life and communities of the area and clearly enjoyed sharing this with us. He made sure to have extra binoculars and bird books on hand. We would gladly book another tour with David. David was our driver/guide on a day trip from Ronda to Gibraltar. He was a superb guide, the best we have ever had. He was knowledgable, polite, fluent, a good teacher, had great stories, listened well and a careful driver. Time with him proved to be some of the most valuable time we spent in Spain because of his knowledge of diverse subjects and his fluency. He gave us insight into Spain that we could rarely get otherwise because of our lack of knowledge of Spanish. Hire him if you get a chance. David was the best! We would like to have his show us around on our next return and that will be soon. I filled our day yet at a comfortable pace. Put on your walking shoes and get ready for a beautiful day with David. Exploring the Triana neighborhood of Sevilla with David was delightful. We enjoyed the conversation, the food, the history, and the culture. A tour for everyone who wants to experience Sevilla beyond the touristic zone. We enjoyed our time in Cadiz with David. We enjoyed the pace and the information he shared. David picked us up at our hotel for the 90 minute drive from Seville to Cordoba. He is very personable, thoughtful and an able and safe driver. Once in Cordoba we were handed off to Professor Luis Mateo, the "official guide", who has a Ph.D. in history and is a font of detailed information and strong opinions. He may be the most learned guide we've ever had. After the "official" tour, we walked the streets of Cordoba with David. We stopped in Carmona on the drive home. David was a wonderful guide and gave us the real flavor of tapas in Triana. He took us to 3 tapas bars and answered all our questions about food and Seville in general. Also he gave us quite a bit of historical information about Spain, Sevilla and Triana. Thanks David for a wonderful tour. David took us to three different Tapas bars which were all unique and frequented by locals. He was very hospitable and ensured that likes/dislikes as well as our special dietary requirements were considered before ordering anything. His recommendations and the food he ordered was all excellent. He shared his culture with us and was a genuine host. Cool tour by a cool guy in a cool area. Highly recommended! David was friendly, responsive, and made for a great time in Seville! He arranged for a private flamenco lesson for us and it did not disappoint. Next trip I plan to work with David on a more extensive itinerary. Triana is an amazing neighborhood where the locals actually outnumber the tourists. David took us to four restaurants for tapas and I ate some of the best food of my life. 4-6 tapas plus a drink at each place - some traditional, some new / funky! Do this at the beginning of your time in Seville so you can revisit this neighborhood for more delicious eats! David single handedly made our time in Seville worth the trip! Punctual, flexible, and simultaneously taught us a lot about Spanish culture, plus, we had a blast!!! We got to meet the pigs!!! The farm is beautiful and the representative from the factory was also fantastic. Then we toured the factory and saw every step of the process and then tasted it. It was so good we left with a bunch. Then we ate tapas and visited the caves - perfect day! We had so much fun we booked another tour with David! Emi conducted a fantastic beginner lesson which fit the needs of two adults and two children ages 9 and 6. She was knowledgeable and fun! We had a great tour with David. The drive to & from The White Villages is spectacular & he shared his knowledge of the Andalusian way of life along the way. There are some amazing stops on this tour & we also enjoyed some delicious tapas. We enjoyed David's tour very much. Not only was he able to give us local perspective and history of the Triana area, but he also introduced us to some delicious tapas and restaurants that we would never have tried on our own. It was a great way to get away from restaurants that cater to tourists and experience authentic cuisine. David exceeded all expectations with our tour. What makes him stand out is his expertise and passion in making sure everyone has an experience that is personalized. He incorporates important facts and interesting stories ("Star Wars" and "amazing race" film sites for our son) that go well beyond any normal tour. You feel like you aren't a tourist and an old friend. He offers walking tours, cooking lessons, biking, kayaking, to tapa and flamenco evenings. We left loving Sevilla because of David's tour. David was a great guide - exceptionally knowledge able about tapas and we had a fun afternoon tapas tour with him at places we would never have found on our own. He also is very keen on doing outdoor type tours and cycle tours of the city. He made our walking tour an educational and very fun experience. We saw much more of the city and learned about the history in ways we would never have been able to on our own. Definitely worth the money! Interesting combination of food, history, recipes, and sensational new tastes. Unforgettable experience! The top of our trip to Seville! El Rocio, the ocean coast, the nature of the Donana park and the great food of the Andalusian breakfast and the tapas gave us a mix of different and unique feelings. David was essential to make all this come true. We loved his company! He is a great person and excellent guide. He made us feel always comfortable, resonded to all our needs and taught us really a lot. We couldn't have asked more! Our first time with ToursByLocals was a great success! Wow. What a treat! From start to finish David made our made our tapas tour in Triana one of the most memorable we've taken. He's a true insider with local knowledge, contacts and passion for his area of Seville. Importantly, the quality of the tapas were among the finest. We compared with other locations over the next days and found ourselves going back to the locations where David took us. Hats off to David. TOUR GUIDE RESPONSE: It was a real pleasure for me Eric to meet you and show you my favorites places in Triana. Warm regards from Sevilla.